When you live in a house full of bookavores, it's not uncommon to come across baskets of paperbacks that you haven't seen in a while. Which happened last night, much to my son's delight. He discovered just such a basket in his closet and squealed at finding so many old friends. One by one, he pulled out a big stack of books to read during dinner, sorted in the order in which he would like them read. This one on top. It's always been one of his favorite Flora stories. Our old copy is severely browning, so I did the best I could with the scans. 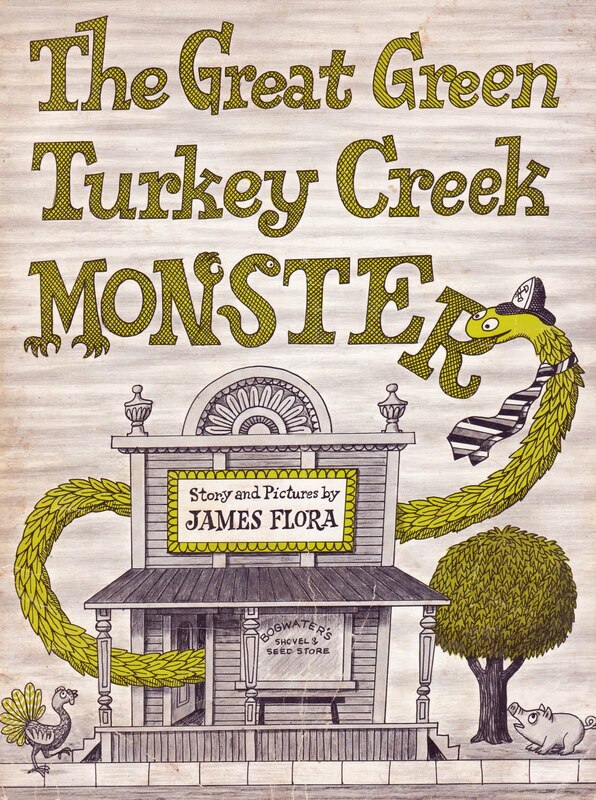 Now, for your Update Friday pleasure, please welcome back a post from September 2008, The Great Green Turkey Creek Monster, brand-spanking new and shiny for today's color-loving kids. On a side note, having a child in a language immersion program is awesome, except they won't allow him to begin reading in English again until the third grade. The bad part is, all the boxes and boxes of chapter books I've collected will have to wait. The good part is, I can stay a read-aloud momma that much longer. 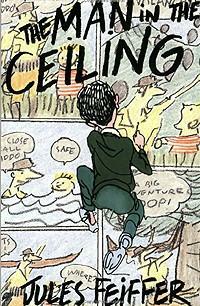 Case in point, we are half-ways through the not-quite vintage Jules Feiffer book, The Man in the Ceiling. It is fast becoming our favorite middle grade book, like, EVER. If you have a child who is an artist or loves comics, man-oh-man is this book for ya'll. I love Feiffer's books (Meanwhile... is a house fave and his Phantom Tollbooth illustrations are fab), and we know some of his old comic strips from The Toon Treasury of Classic Kids' Comics... but with this novel, he is now officially in my book crush club. Love, love, love. I am obsessed with Jim Flora. I have one book. It's about an invisible creature. Thank you for your blog. Jim Flora is an obsession of mine. I have a book about an invisible creature. Just perfect. Thanks for your blog.